Enjoy FREE admission to this “American Idol”-styled show featuring new classical music! 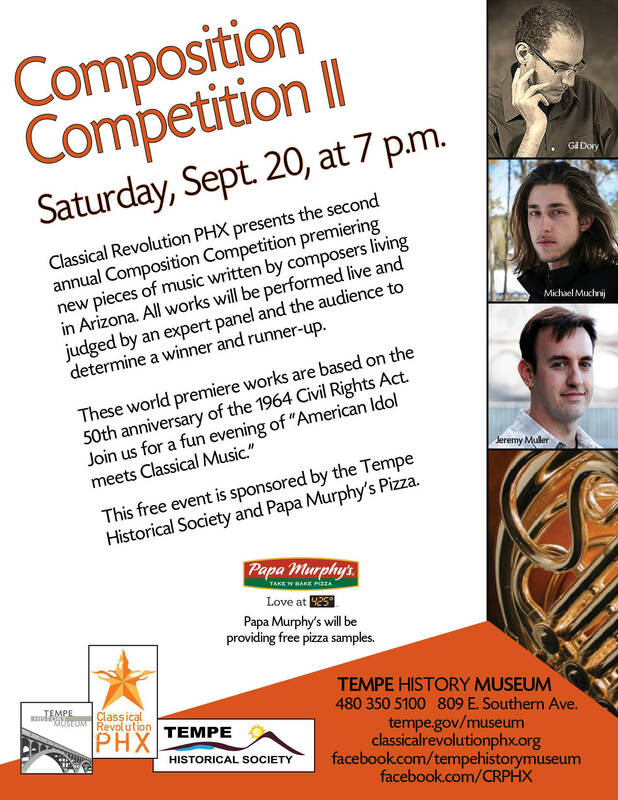 Classical Revolution PHX and Tempe History Museum invite you to an American Idol-style show complete with composers, performers, judges and even a host. The audience will listen to each of three World Premiere Performances and decide which is their favorite by voting with ballots. The judges will provide feedback and commentary throughout the concert, and choose a winner as well, giving us an Audience Pick and a Judges’ Pick for the 2014 Composition Competition II: Celebrating the 50th Anniversary of the Civil Rights Act. Performance begins at 7:00 pm in the Community Room, located adjacent the main entrance and is followed by a FREE reception with take-home gifts provided by local Papa Murphy’s Pizza. Classical Revolution PHX brings you a mix of things you love. Entertaining classical ensembles perform great repertoire followed by a fun and casual open session of classical-music reading. Hang out with the Paradise Winds from 7-8pm and order a few drinks from the impressive selection at The Lost Leaf. Then take the stage with friends or strangers that love classical music, too! Every performer receives two free drinks for playing. 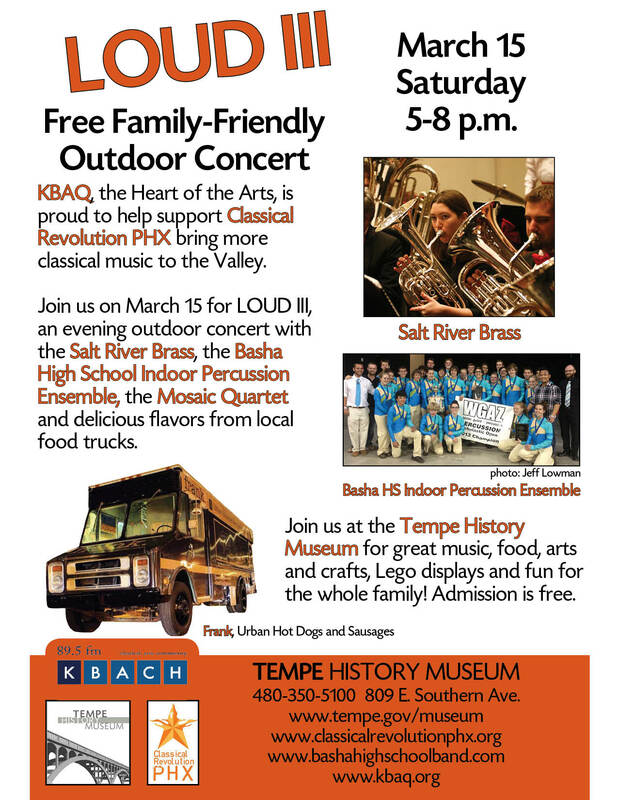 Please sign up on the Facebook event ( https://www.facebook.com/events/1491045047839492/) or send us an e-mail (classicalrevolutionphx@gmail.com) with name, instrument, accompanying artists with instruments (if any), sheet music you can bring, etc., to see what we can put together on the fly! Viva la revolution! The Paradise Winds, a Phoenix, AZ-based chamber wind ensemble with flexible instrumentation, met while pursuing advanced degrees in music at Arizona State University and have been performing together since 2005. Paradise Winds have appeared to over a million weekly listeners on American Public Media’s Performance Today in 2011 and 2013. In recent past, the Paradise Winds were featured in the Phoenix-based award-winning Downtown Chamber Series, were collaborators with the Grammy-winning Phoenix Chorale and have appeared with the grassroots organization, Classical Revolution PHX, Ann Arbor and Cincinnati. Individual members of the Paradise Winds have appeared with Chicago Symphony Orchestra, New World Symphony (Miami, USA), AIMS Festival Orchestra (Graz, Austria), Wintergreen Summer Music Festival Orchestra (Virginia, USA), and in Phoenix with The Phoenix Symphony, Arizona Opera and Arizona Ballet. The Paradise Winds have also appeared locally for the Phoenix Catholic Diocese presenting children’s concerts in Peoria, Glendale, Mesa, Phoenix, Tempe, Scottsdale and Goodyear, AZ. 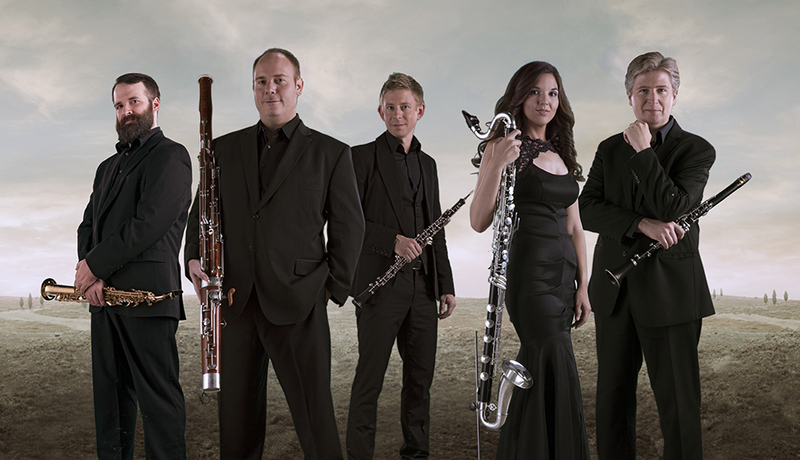 The Paradise Winds are active conference performers, playing consecutive annual conferences for the International Double Reed Society from 2011 through 2013 and in 2014 for the International Clarinet Association. In the U.S., the Paradise Winds have performed at North American Saxophone Alliance conferences in 2011 and 2012. Active teachers, members of the Paradise Winds hold positions at Arizona State University, Eastern Michigan University and in the Maricopa County Community Colleges (Phoenix-area), and have served in positions and given residencies abroad in Belgium, Italy, Germany and Ecuador. Agents of new reed quintet repertoire, the Paradise Winds have commissioned works by Joel Puckett, Kurt Mehlenbacher, Robbie McCarthy and Tom Peterson, and will premiere an original concerto grosso by teen composer, Graham Cohen, during the 2014-2015 season with MusicaNova Orchestra (Scottsdale, AZ). Welcome back the “open mic” dates at Terra Java in Central Phoenix. The time opens with music by the “Silverwood Trio” (Lee Chivers, flute; Carl Chivers, clarinet; Moria Bogardus, cello) at 11:00; then features audience members who wish to perform. Bring your “axe,” music and a happening attitude! We’ll see you there! Classical Revolution PHX brings a medley of a mix of classical ensembles presenting quality repertoire from classical and contemporary classical eras in a fun and engaging format. Tickets FREE for students with valid ID, $20 general admission, $35 premium seating. Featuring Paradise Winds reed quintet in celebration of a special World Premiere performance with MusicaNova Orchestra on January 11. Details below! Admission: FREE, family friendly, all ages and skill levels invited to the open mic session. Please bring your favorite scores and a music stand. A few music stands will be available, as well as a small stage for the performers. We regret there is no electronic piano for jamming unless some unknown volunteer decides to bring one! Each performer receives a free coffee or pastry! Classical Revolution PHX is proud to host the local Paradise Winds in honor of their world premiere performance with MusicaNova Orchestra of Unexpected Affinities, a concerto grosso for reed quintet (soprano sax, clarinet, bass clarinet, oboe, bassoon) and string orchestra with harp and celeste. This is the first-ever American composition of this nature, written by teenage award-winning composer, Graham Cohen. Featured guest Martin Goldsmith, author and Sirius XM DJ, will also provide commentary on the occasion of this world premiere, a Holocaust remembrance and celebration of life. MusicaNova Orchestra with Paradise Winds tickets available here (including for the VIP reception and book-signing) and additional information available here! Join Classical Revolution Phx as we present two local ensembles, Solis Camerata and Paradise Winds, FREE of charge to the public on Sunday morning, April 19, 2015 at 10:30 a.m. at Humanist Community Center, 627 W. Rio Salado Parkway, Mesa. Each ensemble will rotate between selections with educational commentary for about an hour followed by Q&A with the audience. Parking is accessible by an on-site and near-site lot, please arrive a little early, the seating is first-come, first-served basis. All are welcome but we could run out of space!